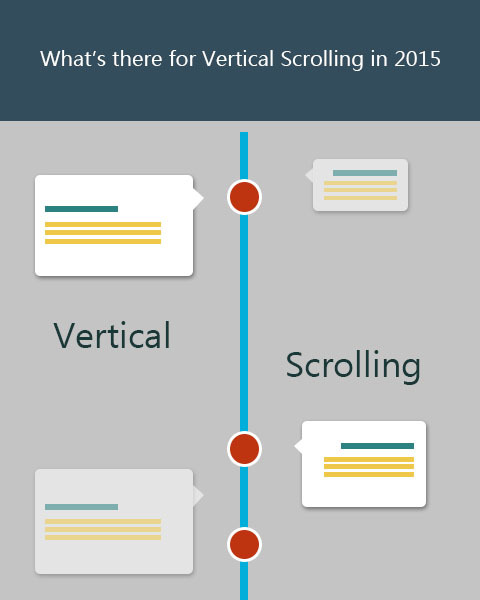 What’s there for Vertical Scrolling in 2015? HomeWeb DesignWhat’s there for Vertical Scrolling in 2015? With single page websites getting all popular, the concept of vertical scrolling has also turned into limelight. The web designers are taking leaps of innovation to push the things a little further. Vertical scrolling is not all about creativity zip-zap now; it has become more of ensuring the user-friendliness of website. The most obvious downside of SEO to a single page website is that all of your site’s content is on a single page; and thus, all of the keywords need to appear on the same page as well. Consequently, it appears more like a keyword-stuffing exercise to search engines and the overall language doesn’t look natural. Although, you can make webmasters and developers implement their greatest of efforts to overcome this drawback; it will still be a daunting task for your marketing team to get the desired ranks. These vertical scrolling accessible single page websites tend to use a grid pattern to weave a narrative around the brand. This narrative can be made even more engaging and compelling via the use of few interactive elements. As more and more brands are adopting storytelling techniques to communicate with their audience, this will be seen in a greater measure this year. As all of the information including images, videos and other multimedia files, is embedded on a single page, the need for minimalism has become even greater. You can’t afford too much glitter on the website as it will only lead to slow loading times. Also, flat designs have perched themselves quite comfortably in the web realm, and they are quite relevant to be used with single page websites. All you need is an innovative approach backed by excellence. Vertical scrolling is more of a shape-shifter and like any other shape-shifting initiatives; the beginning is going to be extremely coarse. Loads of websites have already started implementing this method while we are only getting around understanding it. The crux is: The users want to get down to business and access the information or service they are there to access; and if your design gets in the way, they won’t waste a single second before navigating to your competitor’s website. Mobile-friendliness is of paramount importance these days. Brands consistently look for websites that do not fail in mobile-compatibility as they realize a huge chunk of their visitors come from mobile only. Talk of vertical scrolling websites; they are perhaps the most natural fit for smartphones and tablets. They don’t force the user to keep looking for menu links and let them access all the information with a simple scroll. You need more of power content that has ability to kickstart your message right away and is backed by substance. And since you are making your user scroll through every piece of information, you can’t afford long orations about your company and its services. The content should be crisp and playfully clever. The message should be placed across in as few characters as possible and this is only possible with skilled content writing. Boring and monotonous content will only bring down the website fever. Whatever intent or purpose you hold for your business, vertical scrolling is a definite way to get people engaged on your website. It helps you make your website more accessible and responsive while adding an element of relevancy to it. Executed well, it will synchronize your website and content with the desires of an average web user.